I read 48 books in 2015 and it bugged me that I didn't read two extra books to make it to 50 books, so that was my goal in 2016. 50 books because I get OCD about "complete" numbers like 50 vs 48, haha. But there were just too many awesome books I kept hearing about plus I wasn't working the first six months of 2016, so I had more time to read more than every before. I kept bumping up my reading challenge until I got to 100, though I doubted I'd actually reach it. Looking back, I read 103 books in 2016, which is most likely the most I will ever read in one year. 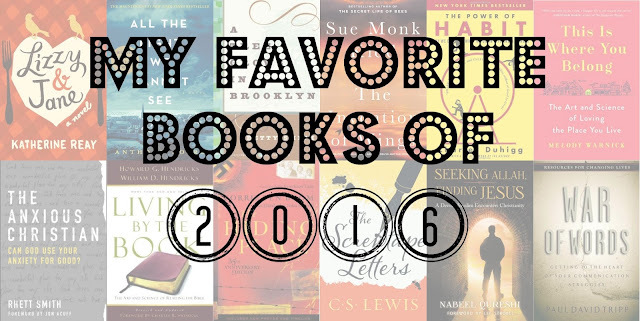 Last year I shared my favorite 2015 reads (read it HERE), broken up in 3 categories. This year I am breaking them up into more categories since I read a lot more diverse books this year. The character development, slow but steady pace, and historical relevance of these books blew me away. I learned a lot while also diving deep into the lives of these strong female protagonists. Again, strong female protagonists, but each of these ladies had a whole lot of stuff they had to work through emotionally throughout the books, which was great to see how this unfolded page by page. Don't let the YA label steer you away; these books are enchanting and the writing was superb! Wolf Hollow and Wonder are tear-jerkers, AWIT is a sci-fi filled with symbolism, and WW is hilarious! And this was not on purpose, but they all start with W haha! You just cannot go wrong with these timeless tales. Whether training for the Olympic rowing team, surviving brutal Japanese interment camps during WWII, or hiding Jews during WWII, these biographies showcase humility and bravery of inspirational people. These memoirs each dive into what it feels like to try something totally new (a real-estate/home reno/home decor franchise, a used bookstore, and training for a marathon) and the unexpected difficulties, joys, and hilarious moments along the way. Whether evaluating introversion, the everyday habits of individuals and businesses, or the idea of placemaking, these books were packed with intriguing research and practical application. These books were valuable resources to help through anxiety, perfectionism, and communication. I'll definitely refer to them again in the future. Didn't notice until now that 3/5 have the verb 'embrace' in the title, haha. A diverse bunch, varying from a memoir of a Muslim man's journey to Christianity, a how-to on inductive Bible study, a close look at a masterpiece and parable, and diving into attributes of God, these all pointed me to God and the truth of the Bible. Have you read any of these? If so, what did you think? Any books you read and LOVED in 2016?